Ever wondered what it would feel like to share a ride with the leader of a country? Some of you might be thinking of questions to ask him/her, what plans he or she has for the country, or may be you would want to take a photo with them. After all, it's not every day that you can share a ride with a head of state. But in the Philippines, your odds of having the 'president' sit inside a car with you are higher. Photos of a lookalike of Philippine President Rodrigo Duterte have been spreading on social media. 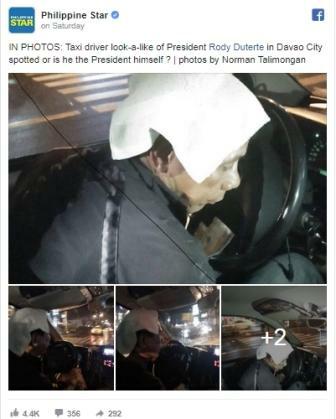 In a photo gallery shared by the Philippine Star, they ask the question whether a taxi driver from Davao is just a mirror image of Duterte or the president himself. In 2013, reports of Duterte moonlighting as a taxi driver during his tenure as mayor of Davao City spread like wildfire on local news networks and social media. 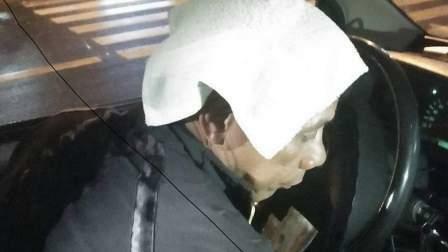 According to one such report, the then mayor would drive a cab, pick up fares, and patrol the streets of Davao at night. A full-on debate has already erupted on the Philippine Star's Facebook page with some users claiming that it is indeed the president of the Philippines. Others were baffled at the striking similarity of the anonymous cabbie to the incumbent president. What do you think? Is Duterte patrolling the streets again? You can decide for yourself when you see the photos below.